This article is about the NPC at Nightgate Inn. For the NPC at the Abandoned Shack, see Fultheim the Fearless. 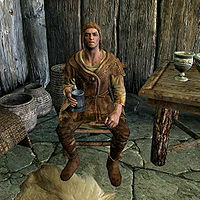 Fultheim, a Nord warrior, is the only regular patron at the Nightgate Inn, aside from Balagog gro-Nolob. He stays there to "drink away unwanted memories", according to the innkeeper, Hadring. Fultheim does very little in life and never leaves the Nightgate Inn. He can always be found in the taproom or his own room, drinking or eating, and never pauses to sleep. Fultheim carries a Blades sword and therefore may be a veteran. He also carries a copy of The Red Book of Riddles, and a few pieces of gold. He wears a belted tunic, with a hat and a pair of boots. When Fultheim sees you, he may remark: "Hadring got himself another customer, eh?" He will also comment on the inn, saying: "The beds and beer are both lousy, you ask me." or angrily ask you: "What do you want?" When asked if he frequents the inn often, he replies, "You see any other inns around here? Where else would I go to drink?" You may also ask him about the inn's other resident. When asked, he will tell you, "Well he don't like company, I can tell you that much. Just wants to be left alone. But no... that's not really it. It's like... he wants to talk. Likes people and all. But he stays separate, because he's supposed to. Kind of sad, really." When exiting conversation with him, he will say, "Sure, walk away. I wasn't talking or anything..."
This page was last modified on 29 March 2018, at 17:55.